Detail of mantle, camelid plain weave with stem-stitch embroidery; fringe. Peruvian (Paracas). John H. and Ernestine A. Payne Fund (1972.353). Photograph © Museum of Fine Arts, Boston. Border fragment, wool plain weave with stem-stitch embroidery. Peruvian (Paracas). Denman Waldo Ross Collection (16.36). Photograph © Museum of Fine Arts, Boston. My first exposure 26 years ago to the spectacular Paracas mantles on display in the MFA’s exhibition of Andean textiles, To Weave for the Sun, was formative and unforgettable. The vivid colors, dynamic compositions and portrayals of elaborately costumed humans, animals and anthropomorphic beings, rendered in minute stem-stitch embroidery, infused my burgeoning curiosity about ethnographic textiles and their ritual use in societies. Fabrics from Paracas culture have long been a source of intense interest ever since the early part of the 20th century, when intricately decorated and finely made textiles from an unknown prehistoric culture began to surface in collectors’ markets in Peru and beyond, devoid of all context. 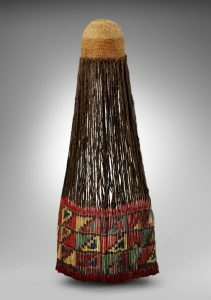 The Museum of Fine Arts, Boston was among a handful of public institutions to receive the first of these textiles prior to the archaeological excavations of their source. These included several mantles and border fragments. I recently studied two of those fragments: one that entered the collection in 1916 (see image, left) and the other in 1921 (see this mantle border fragment). They were gifted to the Museum by Denman Ross (1853-1935), a professor of art history at Harvard University, Trustee of the Museum and noted collector of diverse global art. Thanks to the convictions of a preeminent Peruvian archaeologist determined to preserve and learn from the material culture of his country’s prehistory, new knowledge about these textiles has been developed over recent decades. As I delve deeper into these narratives, I believe the story of the Paracas embroideries and other masterful examples of textile achievement from this culture, one that endured for 900 years, is interlaced with their remarkable survival after two millennia, their celebrated discovery and subsequent interpretation. The long-concealed location of the Paracas weavings was destined to be excavated by America’s first indigenous archaeologist, Julio César Tello, universally known as the “father of Peruvian archaeology.” Tello, an Indian born in the mountains of Huarochirí Province in Peru and a native speaker of Quechua, was obsessed by the embroidered fabrics that were unlike anything he had seen before in Andean culture. 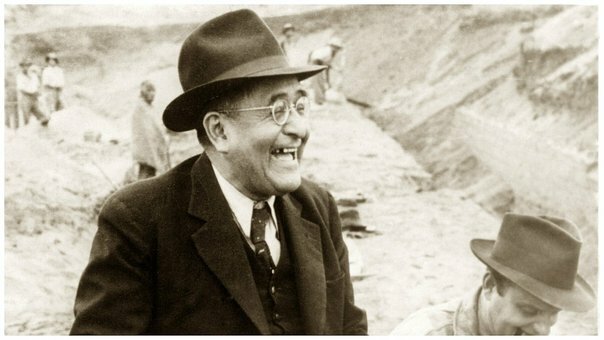 After years of searching for their location, he was able to convince a professional grave robber from Pisco by the name of Juan Quintana to take him to sites on the Bay of Paracas, a vicinity of previous looting that began occurring in 1911. Tello intuited this region could be the fountainhead of the embroideries that were being dispersed to private collections and museums. Map of Peru with inset (lower left) detailing the south coastal region. The Paracas Peninsula is highlighted in red. The word “Paracas” comes from the Quechua word para-ako, meaning sand falling like rain. For several hours in the late afternoon, intense southwesterly winds sweep torrents of sand over the desert peninsula, hence its moniker. Bordered on three sides by the Pacific Ocean, warm desert temperatures of the Paracas Peninsula collide with the wind-driven upwelling of the frigid Humbolt current flowing northward along the Peruvian coast, creating conditions that both prevent precipitation, and promote maximum dryness. Such environmental conditions and protection from light were fundamental to the survival of the ancient weavings that were ritually buried with their dead by Paracas communities. These textiles, encoded with iconographic images whose meaning can only be interpreted in the absence of any written texts, were layered around corpses like skins of an onion, in combination with plain fabrics and other objects associated with the deceased. The body was placed in a seated position within a shallow circular basket, head between the knees, encased within conical-shaped bundles formed by voluminous layers of fabric and clustered in dark, dry tombs where they remained hidden from all knowledge for nearly 2,000 years. 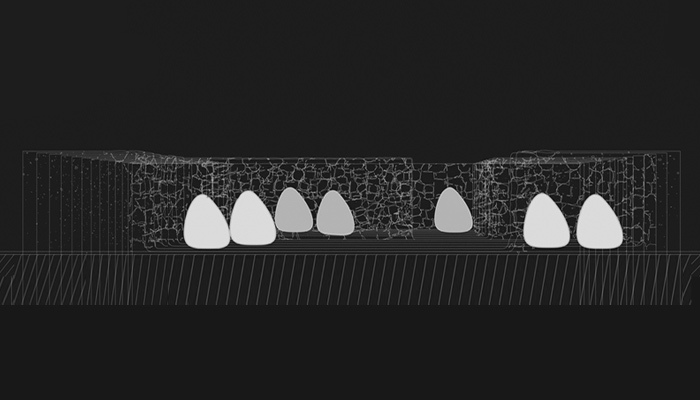 Representation of the Necrópolis of Wari Kayan with cone-shaped funerary bundles. Click image for website source. 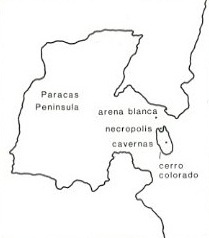 The Paracas Peninsula showing locations of three burial sites in proximity to Cerro Colorado. Tello commenced excavations on the desert peninsula with a team from Universidad Nacional Mayor de San Marcos and Museo Nacional de Antropología y Arqueología between 1925-1929; they began with a survey of their starting point, Arena Blanca, where they found evidence of human habitation, numerous cemeteries, textiles, and pottery. They continued southward to the summit of Cerro Colorado, where they discovered bottle shaped shaft tombs known as Paracas Cavernas. A massive burial precinct was later to be uncovered on the northern slope of Cerro Colorado, referred to as the Necrópolis of Wari Kayan. Excavations between 1927-1928 at the Necrópolis unearthed 429 funerary bundles – a find of epic proportions. 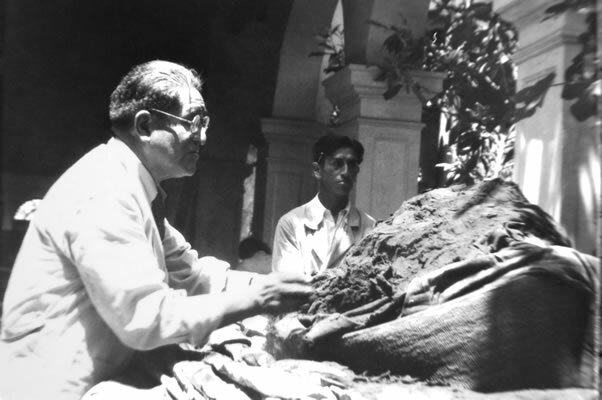 Julio C. Tello examining a Paracas mummy bundle. The bundles were removed from the tombs, transported to the Museo de Arqueología Antropología Peruana in Lima, and later moved to Lima’s Museo Nacional de Antropología y Arqueología, where a new wave of research and study was launched. Under Tello’s supervision, 40 of the largest bundles were opened with meticulous attention to object numbering and a method for sequencing the removal of every item. The largest bundles offered evidence that the deceased were Paracas rulers and high status members of their ancient society. Detail of mantle, wool plain weave with stem-stitch embroidery. Peruvian (Paracas). Denman Waldo Ross Collection (16.31). Photograph © Museum of Fine Arts, Boston. The contents of these Necrópolis bundles are the main record of Paracas culture; its members left no written records about themselves. 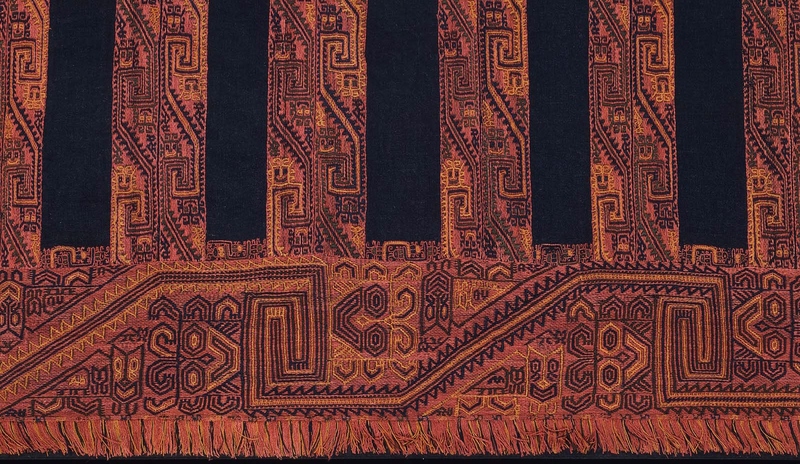 Covered with rows of isolated images, the garments worn by the rulers were a fundamental form of visual communication within Paracas society. But the interpretation of the messages encoded in these weavings is difficult. Faced with an absence of written texts, it is the task of the art historian to make sense out of what is seen on these garments-to learn how to read images stitched on cloth instead of letters printed on a page. Beyond the true meaning and significance ascribed to the Paracas embroideries by their long-deceased makers, compelling research and iconographic analysis has contributed to theories about how these images were meant to be read. Stay tuned for my next post, where I will look at stylistic variations and visual patterns of communication that are characteristic of Paracas textiles.